She speaks for us all, confessing to the check-out clerk with an excited laugh that if it’s going to ice, she’d better get ready. Milk, bread, chocolate bars, corn meal—her choices are different only in detail from the rest of us standing in line, in a store so jam-packed that even the stock boys work up front wearing jackets over their aprons and sacking supplies that will keep us secure when the weather moves in. Cars and trucks crowd the parking lot, some left running with the plumes of their exhaust whipping sideways in the freezing wind. Men wait holding meat, bananas, coffee, restless in insulated tan coveralls with the legs unzipped over their heavy clay-soiled boots, their hair packed down against their heads where knit hats had been. Uneasy in a role usually filled by their wives, they joke, catch up with old acquaintances who also stand in line, promising to call soon, men not accustomed to being off work at one p.m., hurrying home to family before the sleet starts. The cold comes first, thirty-five degrees when I started to town in the morning, twenty two when I return home, fifteen by three. Wind rocks the great oaks side to side, piling stiff dead leaves in new arrangements at the corner of the woodpile, at the steps. Twelve degrees at dusk, the clouded sky pale pink and white, the countryside settling into frozen night. More wood on the fire at midnight and two a.m. I shiver by the fire. The house creaks. Five-thirty a.m. by my bedside clock, the tick-tick of sleet against the windows wakes me. I indulge in another hour of fitful sleep, comforted by heavy quilts and cats at my feet. Plans of all I could do race through my dreams, the albums not finished, correspondence neglected, the watercolors so long set aside. Roads coated in ice mean a day without visitors, a day at home tending the fire, tending myself. Dressed in sweaters not worn for five years, in long socks and with no regard to appearance, I sip hot tea at the window. Only a small shift in the light signals dawn, lifting the dark blue cast of the air to a lighter shade. Barely visible deer move slowly through the woods, pawing at the ice-coated duff. Tiny crystalline flakes of snow filter into the sleet, thickening the white of the downfall, obscuring trees at the fence line. 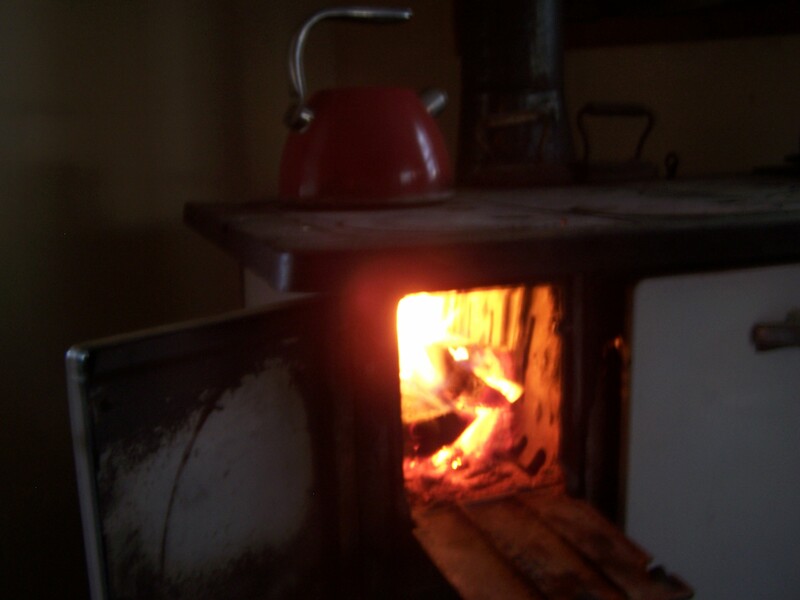 I build a fire in the wood-burning cook stove. A kettle of water with cinnamon oil steams while I craft my list of things to do, tasks that seem too petty or cumbersome for normal days when open roads and obligations burden the hours. I simmer apricots with honey and ginger and fry half-moon pies, edges evenly crimped with tender fork lines. I sketch scenes, the road to my house, the long-familiar contoured hills, and let watercolor swirl on the heavy paper, a skyscape of gray and blue, fields tan, oaks silhouetted black. Freshly washed clothes hang by the blistering stove whose greedy heat soon pulls out all moisture. With satisfying frugality, a pot of vegetable soup thick with garlic and a pan of beans decorate the stove top, cornbread in the small sooty oven. Every few hours I rush out for more wood, lingering coatless in the sharp scent of cold and wood smoke, large flakes of snow tumbling down into my hair, resting on my eyelashes. The winters have not been accommodating in recent years, failing first with abbreviated snows, then disappointing even in temperature. In the onslaught of global warming, the Ozark hills have increasingly remained accessible in deepest January, when a few decades earlier our steep, curving roadways had been reliably impassible for at least two arctic weeks of the year. We grew up expecting that at times chosen by Nature, no one would venture out. The guy with the local wrecker service would make enough money to last until June. In this mid-South clime, we don’t get winter enough to justify the county’s expense for snow plows. It suits us better to schedule school years with extra days for snow. It pleases us to find ourselves unexpectedly confined to the house discovering long lost treasures at the back of the closet, reading magazines, standing at the window as midday lightens the sky to a shade barely more luminous than the snow lying thick on the ground. Lately, with the warming climate, there has been little winter at all. Days have run together, no time to reflect, restore, sleep in the afternoon. We long for the cold, the ice, roads we could not drive, jobs we could not attend. Welcome then this celebration of ancient instincts to stay in the cave, content with the provisions we have hoarded, the firewood we have stacked near the door, wrapped in the warmth we have made. Embrace this triumph of man over the elements, a proof of our adequacy in a time when little else seems so clear. 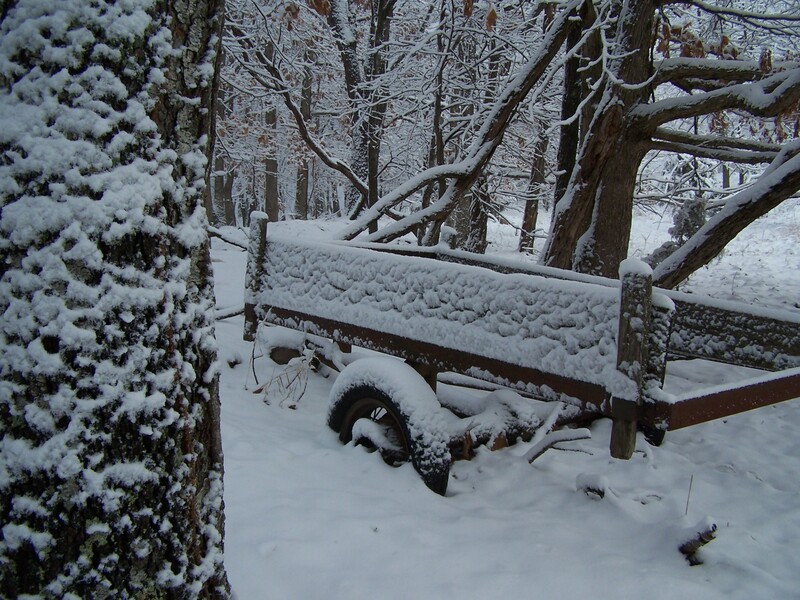 This entry was posted in essay, Local History, memories, Rural Living and tagged cold, country living, fire, ice, retreat from the world, snow, splendid isolation, winter, woodstove on December 28, 2017 by Denele Campbell. I wrote this piece years ago and included it in my book “I Met a Goat on the Road.” The main grocery store in town was the Lafayette Street IGA, back before Walmart decided to take over the grocery trade. That’s not the only thing that’s changed. Today is December 21 and it’s 61 degrees outside. The ten day forecast finds all overnight lows above freezing. So much for a white Christmas. She spoke for us all, confessing to the check-out clerk with an excited laugh that if it was going to ice, she’d better get ready. Milk, bread, chocolate bars, corn meal—her choices were different only in detail from the rest of us standing in line in a store so jam-packed that even the stock boys were up front wearing jackets over their aprons and sacking supplies that would keep us secure when the weather moved in. Cars and trucks crowded the parking lot, some left running with the plumes of their exhaust whipped sideways in the freezing wind. Men waited holding meat, bananas, coffee, restless in insulated tan coveralls with the legs unzipped over their heavy clay-soiled boots, their hair packed down against their heads where knit hats had rested. Uneasy in a role usually filled by their wives, they joked, catching up with old acquaintances who also stood in line, promising to call soon, men not accustomed to being off work at one p.m., hurrying home to family before the sleet started. The cold came first, thirty-five degrees when I started to town in the morning, twenty two when I returned home, fifteen by three. Wind rocked the great oaks side to side, piling stiff dead leaves in new arrangements at the corner of the woodpile, at the steps. Twelve degrees at dusk, the clouded sky pale pink and white, the countryside settling into frozen night. Five-thirty a.m. by my bedside clock, the tick-tick of sleet against the windows woke me. I indulged in another hour of fitful sleep, comforted by heavy quilts and cats at my feet. Plans of all I could do raced through my dreams, the albums not finished, correspondence neglected, the watercolors so long set aside. Roads coated in ice meant a day without visitors, a day at home tending the fire, tending myself. Dressed in sweaters not worn for five years, in long socks and with no regard to appearances, I sipped hot tea at the window. Only a small shift in the light signaled dawn, lifting the dark blue cast of the air to a lighter shade. Barely visible deer moved slowly through the woods, pawing at the ice-coated duff. Tiny crystalline flakes of snow filtered into the sleet, thickening the white of the downfall, obscuring trees at the fence line. It was four degrees. I built a fire in the wood-burning cook stove. A kettle of water with cinnamon oil steamed while I crafted my list of things to do, tasks that seemed too petty or cumbersome for normal days when open roads and obligations burdened the hours. I would simmer apricots with honey and ginger and fry half-moon pies, edges evenly crimped with tender fork lines. I would sketch scenes, the road to my house or the contoured hills, and let watercolor swirl on the heavy paper, a skyscape of gray and blue, fields tan, oaks silhouetted black. Freshly washed clothes hung by the blistering stove where greedy heat soon pulled out all moisture. With satisfying frugality, a pot of vegetable soup thick with garlic and a pan of beans decorated the stove top, cornbread in the small sooty oven. Every few hours I rushed out for more wood, lingering coatless in the sharp scent of cold and wood smoke, large flakes of snow tumbling down into my hair, resting on my eyelashes. The winters have not been accommodating in recent years, failing first with abbreviated snows, then disappointing even in temperature. In the onslaught of global warming, the Ozark hills have increasingly remained accessible in deepest January. A few decades earlier, our steep, curving roadways had been reliably impassible for at least two arctic weeks of the year. We grew to expect that at times chosen by Nature, no one would venture out. The guy with the local wrecker service would make enough money to last until June. In this mid-South clime of Northwest Arkansas, we don’t get winter enough to justify the county’s expense for snow plows. It suits us better to schedule school years with extra days for snow. It pleases us to find ourselves unexpectedly confined to the house. In that splendid isolation, we might discover long lost treasures at the back of the closet, read magazines, stand at the window staring out in silence as midday lightens the sky to a shade barely more luminous than the snow lying thick on the ground. Lately there has been little winter at all. Days have run together, no time to reflect, restore, sleep in the afternoon. We long for the cold, the ice, roads we could not drive, jobs we could not attend. Our bodies crave hibernation. Welcome then this celebration of ancient instincts to stay in the cave, content with the provisions we have hoarded, the firewood we have stacked near the door, wrapped in the warmth we have made. Embrace this triumph of survival over the elements, proof of our adequacy in a time when little else seems so clear. 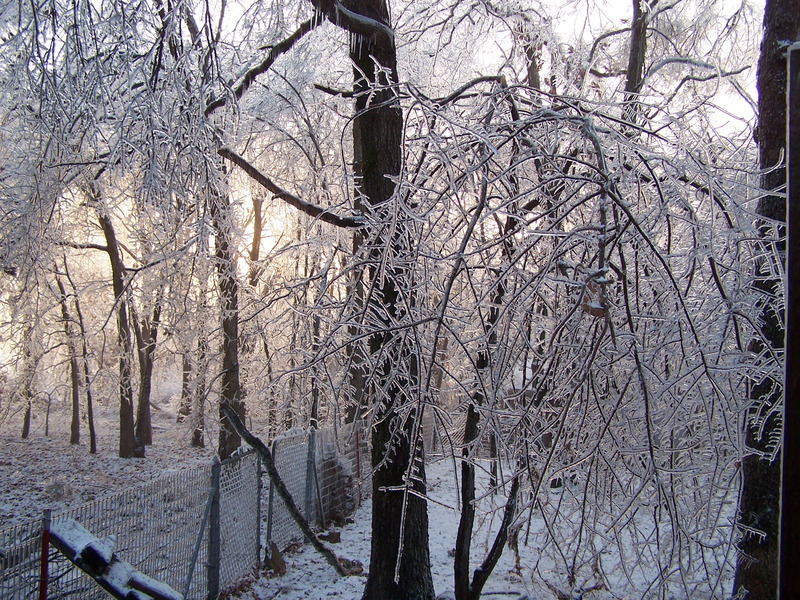 This entry was posted in Rural Living and tagged global warming, hibernation, ice, snow, time off, vacation, winter on December 21, 2015 by Denele Campbell.